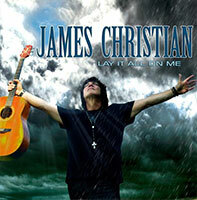 RockUnitedReviews: James CHRISTIAN: "Lay It All On Me"
James Christian - one of those all-time great singers of melodic rock and AOR. Not always blessed with great material though and I still think of his "Rude Awakening" album as the very best effort. However, song and material-wise, this is almost up there among his very best. He doesn't shun eighties fluff melodies on this record, in fact the man embraces it on "Lay It All On Me", but generally avoids becoming overtly sappy, even if I could do without the sentimental sap/crap of "Let It Shine". Ship-loads of dut-dut keyboards and it's definitely the ultimate Miami-Vice/ feel-good flashback moment of 2013. Very catchy. Very catchy indeed. But seriously dude, what ever happened to the (lack of) bass and especially drum sound? The overall impression you get here sadly is of an unfinished production. You can't possible play, "Lay It All On Me", too loud on proper stereo equipment as the darn thing will literally make your ears bleed. Considering all the $$$ Frontiers' been making in the past five years - it's shocking to (still) find such low quality (sound-wise) among their releases. Frontiers are after all the biggest independent label (I'd use the term label very loosly here) of classic rock and melodic schlock. Surely they'd want their brand to be connected to quality? this very record should no doubt have been remixed and re-recorded (bass/drums) prior to release. Bottomline: Great vocalist, great songwriter. Absolutely horrible as producer on this particular piece of plastic. Yngwie Malmsteen - a friggin' genius of producer in quick comparison? Love the actual songs though.